As the new Assistant Minister for Vocational Education and Skills, I am moving quickly to support the Government’s agenda to raise the status of apprenticeships and vocational training generally. As Australia celebrates National Skills Week, we are taking the opportunity to promote the diversity of practical and vocational learning. I am committed to a high quality VET system that ensures students are trained in skills for real jobs. As a mechanical engineer, I understand the role VET plays in our economy. My on-the-ground experience gave me a unique view of the benefit of industry-led training in developing the skills Australia needs to innovate and adapt to changing economic conditions. In a competitive global environment, our VET system must help equip people with the skills they need for employment now and in the future. Similarly, my work in industry and industrial relations before I entered Parliament taught me to appreciate the role apprenticeships play in productive workforces and people’s working lives. Apprentices have a job from day one and the record shows they are likely to have ongoing employment. This is why Australian Apprenticeships are high on the Government’s agenda. Building on the Government’s first term reforms, completion rates of apprentices will continue to be a primary focus.I announced recently new pilots that will test apprentice training models and provide alternative skills development for industry. The Government is determined to see vocational education and training is positioned to play an even bigger and better role in our education system. Ensuring industry and employers have confidence in the quality of VET qualifications is high priority. High quality training and assessment is what underpins this confidence and raises the status of VET. I will work hard to build this confidence. I look forward to working closely with our vocational education and training sector. VET is a vital of Australia’s tertiary education system and we want to keep it that way into the future. 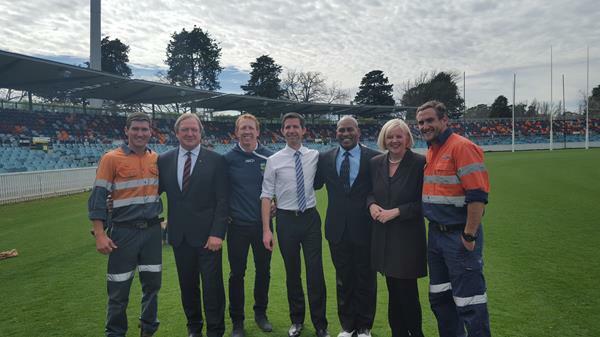 On 29 August 2016, the Minister for Education and Training, Senator the Hon Simon Birmingham and Assistant Minister for Vocational Education and Skills, the Hon Karen Andrews MP launched National Rugby League (NRL) Australian Apprenticeship Ambassador videos and announced the partnering of AFL SportsReady with the Australian Apprenticeship Ambassadors programme as part of the 6th National Skills Week. The Ministers were accompanied by Australian Apprenticeships Ambassadors from the National Rugby League (NRL) Alan Tongue, Australian Football League (AFL) Kevin Sheedy, Channel 7’s House Rules winners Luke and Cody Cook and ACT Training Awards winners and finalists. The NRL players’ stories are available on the Australian Department of Education and Training’s YouTube channel and the AFL’s stories are available on AFL SportsReady’s YouTube channel. The Australian Industry and Skills Committee (AISC) hosted the bi-annual Industry Reference Committees (IRC) Chairs meeting in Melbourne on 26 August to discuss the opportunities and challenges ahead in implementing the new arrangements for training product development, including the priorities of the AISC. The meeting of almost 70 IRC Chairs from across Australia, along with the AISC and representatives from their allocated skills service organisations (SSO), acknowledged the significant body of work that had been undertaken to implement the new arrangements, including the broad industry engagement that had occurred to date. The Hon Karen Andrews MP, Assistant Minister for Vocational Education and Skills, presented the keynote address, highlighting the importance of the skills portfolio and the national training system to employment and economic growth in Australia. The Minister outlined her keen interest in education and training and her desire to build on the work of the IRCs and maintain a strong industry-driven system. AISC Chair, Mr John Pollaers, worked with IRC Chairs to address a number of matters arising from the implementation of the new arrangements, with a focus on the refresh of IRC structures and membership, the development of business cases and the completion of the IRC 4-year workplans. Mr Pollaers encouraged IRCs to use these opportunities to focus their industries on meeting the challenges ahead, in particular, ensuring employers in their sectors have the workforce they need to capitalise on growth opportunities. Feedback from IRC Chairs was robust and welcomed. Mr Pollaers emphasised that, while the AISC wanted to see innovative approaches, the mechanics of the system – such as the structure and membership of IRCs and the content of workplans and business cases – must be right for the relevant industry sector and proportionate to the issue being addressed. Mr Pollaers also encouraged Chairs to raise issues with their SSO, and directly with the Department, if they felt something was not working efficiently and effectively. IRCs Chairs also had the opportunity to use their experience, skills and knowledge of their industry sector to provide input into two key initiatives impacting the VET sector. The Department of Employment welcomed IRC Chairs’ feedback on the opportunities and challenges associated with implementing the Australian Government’s Youth Jobs PaTH program. The program is designed to give young people the employability skills and work experience they need to get a job. Further information is available at http://www.employment.gov.au/youth-jobs-path. Representatives from the Victorian Department of Education and Training also received feedback from IRC Chairs about key aspects of the work they are leading work on behalf of all jurisdictions on future training product reform. In November 2015, Ministers asked senior officials to commence longer term work to ensure that training products – including training packages – remain relevant in the future and support skills development as technology, jobs and industries change. An initial tranche of this work is expected to be considered by Ministers later this year. Throughout the day it was acknowledged that IRCs are a important group, leading change and building on the strengths of Australia’s training system. The 70 IRCs will continue to work together to make sure the VET system delivers the current and future skills that employers need. For more information about the day visit - https://www.aisc.net.au/media/communique-industry-reference-committee-chairs-meeting. To find out how you can get involved visit the IRC page. USI RTO Webinar (New Functions and Expert Tips) – Replay Available NOW! The webinar also featured a presentation from the National Centre for Vocational Education Research, regarding correction of AVETMISS records. You can now watch it on-demand, via our website. This webinar is recommended for any student support and VET reporting staff and managers. To keep up to date with the USI, please visit our website. The Australian Vocational Education and Training Management Information Statistical Standard (AVETMISS) is regularly reviewed to keep pace with the changing needs of the VET sector. Feedback from RTOs and student management system (SMS) vendors has contributed to a new release of the Standard, Release 8.0, which will come into effect from 1 January 2018. • The Get ready for Release 8.0 flyer provides RTOs with an overview of the changes and associated timelines. • AVETMISS 8.0 for VET Providers: what’s changing from release 7.0 details the changes between Releases 7.0 and 8.0 to the AVETMISS Provider Collection specifications, the AVETMISS Data element definitions, and the AVETMISS Validation Software (AVS) business rules. To find out more join the free Get ready for AVETMISS Release 8.0 webinar on Wednesday 21 September at 11.30am —12.30pm AEST. Register now. • encouraging apprentices to tap into wider support networks. Why should my students attend the 2016 WorldSkills Australia National competition in Melbourne? • ULTIMATE SHOWDOWN – Be sure to catch the speed tests occurring across all three days, where competitors will be tasked with completing a small project in a “bragging rights” style timed competition. • HARNESS INSPIRATION - Take advantage of speaking to members of industry-leading organisations such as RMIT University, Dermalogica, Pallion and the VACC about the endless opportunities available through VET. • GIVE IT A GO - Take advantage of the broad range of Try’aSkill activities and go in the running to win one of three great prizes – a hoverboard, a Samsung VR or a iPad 4G – and don’t forget to visit The Gordon’s NAO robot at the Innovation Hub! The National Competition is supported by the Victorian Government and will be held from Thursday to Saturday, 6-8 October at Melbourne Showgrounds. Entry into the National Competition is FREE, and there will be trains running from Flinders Street directly to the event. Register today. The Hon John Barilaro MP, Minister for Skills, Minister for Regional Development and Minister for Small Business will be hosting this year’s event. Training Services NSW in the NSW Department of Industry welcomed the National Rugby League as a new alliance partner for the 2016 Training Awards. More information is on the Training Services NSW website. are the peak State awards for vocational education and training, recognising quality, innovation and excellence in training. The awards acknowledge and reward individuals and organisations that excel in training. Individuals have the opportunity to be recognised for their potential, boost their profiles and build their careers. Organisations are also recognised and rewarded for innovative approaches to training. The winners of the South Australian Training Awards will be announced on Friday 9 September 2016. For more information, please visit www.satrainingawards.sa.gov.au. 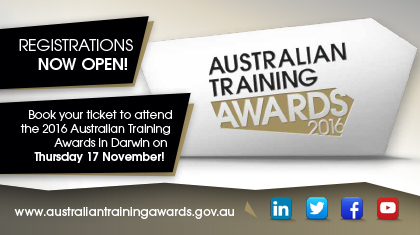 To book your tickets for the presentation event visit the Australian Training Awards website. An opportunity to develop a content based hub that supports your information and resource needs into the future. We have recently commenced the redesign of our website, specifically the content structure and access points for our users. We are seeking expressions of interest to participate in a short, online activity that should take no longer than 15min. Please contact us via email with your expression of interest. Projected dates for the trial are the weeks beginning 5 and 12 September 2016. Are you looking for a free resource that provides current and relevant information to guide and support those interested in apprenticeships and traineeships? Information sessions are free and of value to anyone involved in apprenticeships or traineeships career discussions, promotion or marketing of this sector. Webinars will also be available for those unable to attend. On behalf of the relevant IRCs, we will be collecting feedback on each of these work plans until Friday 9 September. 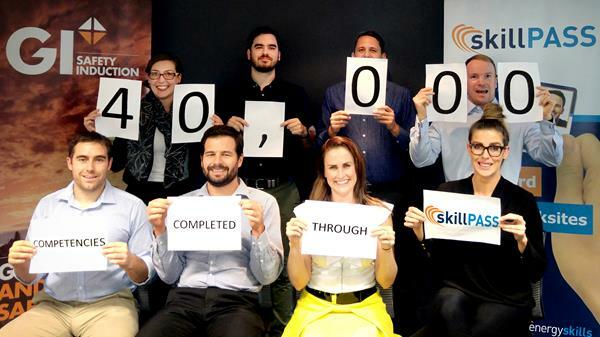 Energy Skills Queensland has reached a major milestone, achieving 40,000 competencies processed and available through the SkillPASS competency management system. SkillPASS now accommodates more than 40,000 independently verified competencies for its growing 12,000 strong user database. This result demonstrates the ability to create safe and productive workforces through effective competency management. SkillPASS provides organisations with a user friendly, online application to manage safety and compliance for their employees in one location. It facilitates a high level of quality control and ensures data validity and integrity. SkillPASS is a system that provides a cost effective solution to tracking and verifying skills for a safer, more productive workforce. SkillPASS continues to evolve through feedback from stakeholders. SkillPASS now allows access to web-based training and inductions and is conveniently able to book face-to-face training through a smartphone, tablet or computer, creating one platform for management of an organisations and individuals training. SkillPASS is an initiative designed and managed by Energy Skills Queensland. To find out how SkillPASS can change the way you manage your workforce safety and compliance, please visit www.skillpass.com.au or call us on (07) 3721 8800. In recognition of International Literacy Day on 8 September, we honour the 2015 winner of the Excellence in Language, Literacy and Numeracy Practice Award Lyn Wilson. 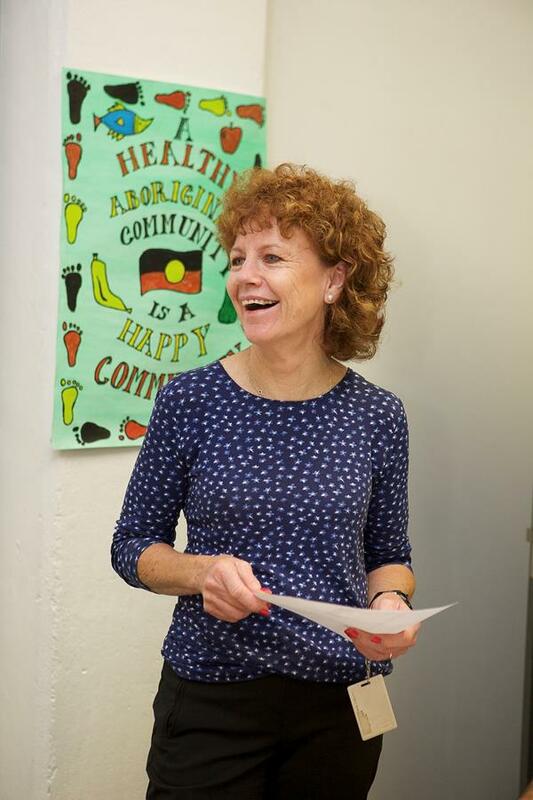 Lyn Wilson has extensive experience in successfully delivering a highly diverse range of language, literacy and numeracy programs in New South Wales. For over 20 years, Lyn has managed the Sydney TAFE - Petersham College Foundation Studies section, which is known for its outstanding links with industry and its successful delivery of foundation skills and pre-employment programs. This success is largely due to Lyn’s ability to establish and maintain the loyalty and support of a large committed staff, as well as valued relationships with external stakeholders. Lyn’s model of good practice, and designs of Indigenous pre-employment and other training programs, have been the key to the significant number of employment outcomes achieved for Aboriginal people in Sydney. To celebrate World Tourism Day on 27 September we honour Raymond Fordimail, finalist 2015 Australian School-based Apprentice of the Year Award and Yupunu Fiona Marika, finalist 2014 Aboriginal and Torres Strait Islander Student of the Year Award. Raymond Fordimail is passionate about Jawoyn country and sharing its beauty with visitors from all over the world. His work and studies have enabled him to develop the skills to share his culture through employment with Nitmiluk Tours at Nitimiluk National Park. Raymond says his Australian School-based Apprenticeship has given him the opportunity to finish Year 12 and gain formal qualifications all while doing a job he loves. Raymond has always enjoyed the peace of the Katherine River and believes that his qualification has provided him with the communication skills and confidence he needed to articulate the significance of the area to his clients. A passionate storyteller, Raymond’s career allows him to connect with people from different countries and backgrounds. Yupunu Fiona Marika commenced her studies towards a Certificate II in Conservation and Land Management at the Batchelor Institute of Indigenous Tertiary Education in 2012. 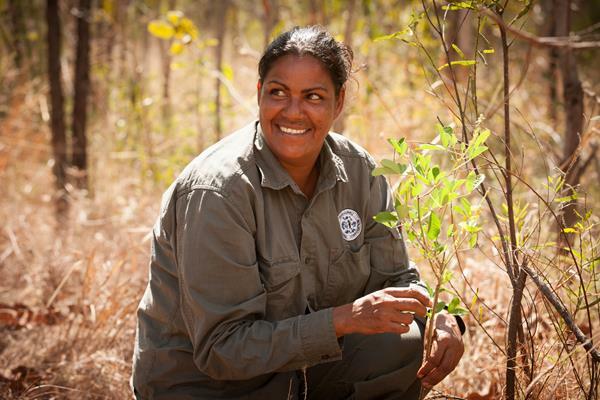 She completed all the units in just over 18 months while working full-time as a Ranger on Country with Dhimurru Aboriginal Corporation. Yupunu is now one of three senior rangers with the corporation, and she leads a team of rangers in a range of land and sea-based management activities. This role requires her to provide mentoring, direction and leadership to the staff with whom she works. Yupunu shares her cultural knowledge through her weekly visits to the Yirrkala School, where she and another ranger lead a Learning on Country programme. The Australian Council of Deans of Education Vocational Education Group (ACDEVEG) in partnership with the School of Education, University of Technology Sydney and Sydney TAFE is holding the 2016 National Conference. The conference theme for this year is Research, Policy & Teaching Practice: building connections. The program is an important forum for VET practitioners, teacher educators, researchers and policy makers to share knowledge and to work collaboratively in the VET sector. Visit the conference website for more information and to register online. Building on the success of the National Adult Literacy and Numeracy Assessment Conference (NALLNAC), ACER has decided to expand the scope of the conference, to be called the ACER National Adult Training and Assessment Conference (NATAC). The theme for NATAC 2017 is Assess, train and learn: Foundations for the future. Please save these dates in your calendar. Topics and sessions to be included in NATAC 2017 will address quality systems in VET, including assessment and links with industry; quality trainers, including the skills/capabilities that VET practitioners need to develop; and quality teaching and learning practices. NATAC will continue to include a significant LLN stream. AITD's eLearning Essentials online course - This online course will model best practice as you work your way through the learning process, engaging with the content, the trainer and other participants. Insources website - to find out details about webinars, workshops and consulting services. Skills DMC Onboarding Skills Sets are now available for improving safety and productivity in the Drilling, Extractive and Mining sectors. Skills DMC also have three new products containing Learner Guide and Mapping and Solutions documents to support the delivery of training programs for operational roles in the Resources and Infrastructure Industries. Blackwater Projects has a complete suite of TAE40116 materials now available – includes validated assessment tools, participant manuals, and detailed session plans. If you would like to provide feedback, supply an article for inclusion in the next edition or join our list of subscribers, please email skillsatwork@education.gov.au. The next edition will be published in September 2016. Submissions are due by Monday 19 September 2016.